Parents Night Out Metro Detroit Events – Need to get away for Date Night? Listing of Parents Night Out events in Oakland County / Metro Detroit MI that can entertain children for an evening. No need for a babysitter, let these venues entertain your kids for a few hours while you spend a special night out with your date! These local businesses hold regular Parents Night Out events. I’ll list dates when I know about them. Some hold Parents Night Out events so regularly that you may just need to make a quick phone call to find out the next date. For kids ages 4-10. Drop the kids and enjoy a night out while the kids enjoy Jump-A-Rama obstacle course, craft, a bouncer, and pizza. A movie will be shown. Open to residents AND non-residents. Pre-registration required. Drop your kids off for a fun filled night of Lego and robots once a month at any Metro Detroit Robot Garage location. Pre registration required. Bloomfield Gymnastics turns up the music so you can tumble, dance, play games, tell stories, and most of all, have the best time ever. Have fun with friends and make lots of new ones. For more information, call Brooke Meathe at 248-730-0307. Cost is $20. Ultimate Lego fun at Brick It Up in Clarkston MI – an entire house dedicated to Lego and Robotics! Parents’ Night Out is from 6pm-9pm, generally on one or two Fridays of each month, with certain exceptions for holidays or previously scheduled activities. Call to pre-register. Review – pics. Parents Night Out events at Stars & Stripes are from 6p-9p for kids ages 4-12. Kids enjoy obstacle courses, trampolines, games, and a pizza dinner! Pre-registration is required. Review – info. Hosted by Farmington Hills Parks and Rec. Kids Parents Night Out evening art classes. Kids ages 6 to 12 can dress for a mess and will be safe and productive from 6:30p-9:30p on select evenings. Call for cost info. Pre-registration required. fLipSpot hosts a Friday Night fLipOut Parents Night Out event every Friday from 7:45p-9:25p for kids ages 10 and up. The cost is $15 at the door and includes pizza and drink. Review – pics. Held at Novi Civic Center and hosted by Novi Parks & Rec. Drop your kids off for an evening of fun, games, crafts, pizza, and more. Open to residents and non-residents. For kids K-6th. Must pre-register. Call 248-347-0400 for more info. Specials for teens often include laser tag or arcade games plus drink or pizza options depending on the special or the day. Some parents night out events include pizza, games, drinks, and a fun theme. Oakland County Parks hosts fun PNO events at their nature centers and waterparks for kids ages 5 and up. These parents night out events typically involve a movie, craft, nature presentation or activity. Children 5 to 11 years old only, please. $15/child. Register – 248-858-0916. Contact Oakland County Parks to register. Urban Air offers Air 4,5,6, for kids in grades 4, 5, and 6 every other Friday from 9p-11p and TEEN Night for kids ages 13-18 every other Saturday from 9p-11p (call for dates). Each will have Free Pizza, and activities for kids such as dodgeball tournament, foam pit challenge, or a slam dunk contest. Includes pizza, glow stick and access to all attractions. 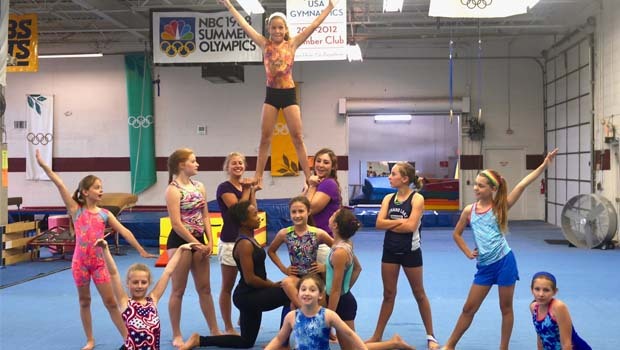 Drop your child off at GTC for a night of gymnastics and fun. For ages 4 -12. Includes open gym, Ninja Warrior Obstacle Course, foam pit, bounce house, pizza & juice, sometimes a movie. To register, call 248-852-7950 or visit gtcgymnastics.com. GTC also hosts “NERF Night Out”, a similar event but with nerf guns and more! Drop your kids off for a fun filled night of Lego and robots once a month at any Metro Detroit Robot Garage location. Almost 11,000 square feet of indoor fun for toddlers and kids (ages 3-12). They even have an indoor arcade. RP hosts regular themed Parents Night Out events. Call today to pre-register. Price includes pizza, movie, dedicated game time, arts and crafts. Pajamas welcome! Review – pics. $30 per child (ages 4+) includes kid-friendly movies, crafts, singing and dancing all with a Princess (and Prince) as your host. Snacks will be provided. Children should come dressed in their PJs or cozy attire and can bring a favorite blanket or pillow. Must pre-register! Fun-filled evenings of pizza, games, crafts, inflatables, movies, crafts and more! Some events even feature swimming and movie pajama parties. For kids ages 1-12. For cost info and to register, call Laura Barrick at 248-352-8000 ext 314. Review – pics. Kids grades K-5 are invited for a fun evening at the gym and the pool. Bring your gym shoes and your bathing suit for fun at the JCC. For ages 5-11. Kids Night Out is the perfect opportunity to drop your children off at the Nature Room. Kids will enjoy a fun-filled three hours focusing on seasonal nature activities! Program features games, a snack, live animals and science experiments. This parents night out Metro Detroit page is intended to be used as a guide. Oakland County Moms does not endorse these events. Oakland County Moms is not responsible for changes to event descriptions, event times or details being altered without notice or cancellations. Contact us or call us at 248-534-3934 to be listed in our Parents Night Out Metro Detroit Events page.